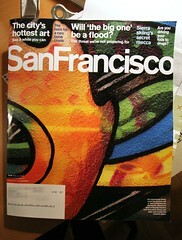 The February 2006 issue of San Francisco magazine has a nice article about the San Francisco graffiti scene. The cover is a closeup of this piece by Apex. At the end of the article they give a little shout out to some SF-specific graffiti resources including Piece by Piece, Quality of Life, and our very own Graffiti Archaeology. Thanks fellas! January 24, 2006 on 9:31 pm | In related links | Comments Off on obsess much? As you can probably tell from looking at this site, I like to take photos of graffiti. A lot. At least once a week. Two or three times if possible. If a weekend goes by and I haven’t visited at least one of my favorite spots, I feel bad about it. It goes like this: “What if something great went up yesterday, but it gets painted over tomorrow? If I don’t get out there right now and take some pictures, it’ll be gone forever. I can’t let that happen!” And so, often against my better interests, I pack the camera in the bag and go. I’ve even considered calling in sick* just to take graffiti pictures. Update: Ahree Lee has been doing something similar since 2001, and stitched some of her photos together into a pretty seamless video. I actually added this layer a couple of weeks ago, but wasn’t able to post the update because the server hacking incident knocked out our ability to edit the blog until just now. Shown here are three new pieces by Apex, Neon, and Jase, plus some amazing characters by Chor Boogie from San Diego. Sorry for the lack of updates recently: our server got hacked over the holidays, and it’s taken us a while to get all the pieces back together again. 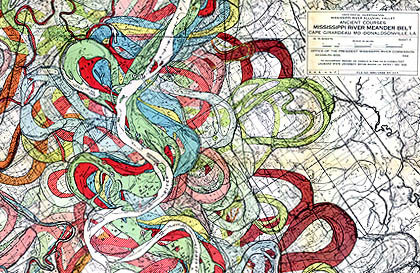 Here’s one very cool thing that came to my attention recently: it’s a map of the alluvial valley of the Mississippi River, showing how the course of the river has changed over hundreds (thousands?) of years. Each color represents a different moment in the river’s long history, and the images are layered up so you can see it all at a glance. What a great idea! I wish I could say I came up with it first, but these maps were drawn up by Harold N. Fisk in 1944. If you’d like to see the whole thing in more detail, there’s a high-resolution version (4 MB, 1000×5871 pixels!) on Flickr.